At first no one wanted it: In July 2010 a single bitcoin could be bought for just 4 euro cents — if you even knew what it was let alone where and how to buy it. As of 29 October 2016, the technology that started the blockchain revolution, represents a market cap of more than € 10 billion, and a single bitcoin is worth € 647. Exactly 35 months earlier, on 29 November, 2013, the market cap was also about € 10 billion, but a single bitcoin could be sold for € 870.87 — still its highest price to date. The price of a bitcoin in relation to any traditional currency is, of course, not determined by the Bitcoin network itself, but by traders on independent exchanges or by individuals who sometimes as a matter of convention refer to the rates listed on those exchanges. In the absence of anything better, we consider the average price across many exchanges as calculated by a company like BitcoinAverage.com to be an authoritative source. What should nevertheless be apparent to anyone who has spent time studying the sector is that Bitcoin is not a normal market by any stretch of the imagination. It is dangerous — for regulators and users alike — to pretend that it is one. A market of € 10 billion is a remarkable success considering it didn’t even exist 9 years ago, and yet it is still small enough to be manipulated by anyone big enough to do so. This idea should surprise no one. We’ve seen enough volatility over the years to suggest there have been many stunts with price. In the other digital currency markets, which are much smaller, it is even worse. A better way of understanding Bitcoin is to view it as a startup. Its core team is a globally distributed collection of individual open source developers. Its product is the decentralized P2P network that is simultaneously also a crowdfunding channel and a crowdfunding source. As with Bitcoin, the valuation of a startup is very volatile in its early years, a reflection of the inherent risk of starting something new while facing many cutthroat competitors. Investors in a traditional startup would expect to receive shares in a new enterprise. In the Bitcoin scenario there are digital tokens that allow investors to exit relatively easily by transferring them directly to someone else or selling them on an exchange. With crowdfunding just as with startups, the milestones reached by the team help determine the value of the enterprise as well as the project’s viability. A critical milestone for Bitcoin has just been reached with the October 27, 2016 release of the innovative Segregated Witness update in version 0.13.1 of Bitcoin core. Segregated Witness, also known as Segwit, is a major update to the software. It makes Bitcoin more secure, more efficient, scalable, resilient, and resistent to certain kinds of attacks. The update holds out the promise of providing support for innovative smart contract and side-chain solutions. It makes trustless, decentralized zero-confirmation transactions a possibility. It also increases the number of transactions that the Bitcoin network can handle in a second by reducing the amount of space a transaction takes up in every block. As a result of this change users may eventually see transactions confirmed more quickly and included more often in small embedded devices for the “Internet of Things”. It is called Segregated Witness because the signature that verifies each transaction, known also as a “witness”, is moved to a separated area in the blockchain that does not count toward the blocksize limit, which is currently fixed at 1 MB. There has been contentious debate about the 1 MB limit and the need for increased scalability. Conferences have been held around the world to specifically address it. 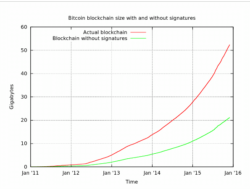 The Bitcoin XT hard fork introduced by Gavin Andresen and Mike Hearn proposed to increase the limit, but the majority of users rejected it. 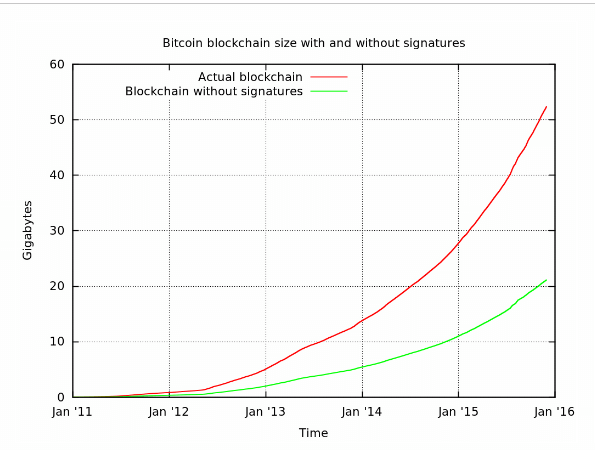 Segregated Witness should have more support than Bitcoin XT did, but its success is by no means guaranteed. Starting on 15 November 2016 miners can signal their acceptance of the change. If less than 95% of the blocks within a certain period are not mined by a miner who supports Segwit, the update will not be activated. However, the code has finally been deployed after almost a year of development and testing. The exchange market seems to have responded very positively; since Segwit first entered its testing phase at the end of April 2016, the price of a bitcoin has increased more than 79%. More details on Segregated Witness will be discussed during Bitcoin Wednesday on 2 November 2016.